No matter what you call them, you’ll call your paint beautiful! At Autogeek, we’re accustomed to calling them bonnets, but Cyclo likes to call them pad covers. Either way, these fabric covers will buff your vehicle’s paint to a gorgeous shine using your Cyclo Dual-Head Polisher. The pad covers are made in two varieties: microfiber suede and cotton terry. Each fabric has a specific function in the detailing process. The pad covers fit snugly over foam pads with a durable elastic cuff. They will not fly off, bunch, or tear as you buff your paint. These pad covers are made for 4” pads. Do not attempt to use a pad cover without a pad underneath. The pad will provide a cushion between your paint and the pad holder (backing plate) to prevent scratches. Microfiber Suede: This is the softest fabric of the two pad covers. The microfiber is manufactured to mimic the softness of suede. 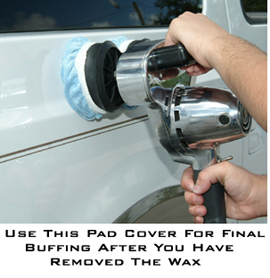 Use this pad cover for final buffing after you have removed the wax residue. It will pick up any remaining dust and gently buff your paint to a glossy shine. Cotton Terry: The 100% cotton pad cover is ideal for removing dried polishes and waxes, and gentle polishing. The hooked fibers are excellent at removing residue and gently polishing the paint surface. Cyclo also says it can be used to clean interior surfaces. Remember, you will need two pads and two pad covers on one Cyclo. Here’s a time-saving tip: Put a terry pad cover over the head you are going to lead with. Put a microfiber suede cover over the other head. As you buff off wax residue with the leading head, the second head will buff your paint to a brilliant shine while removing any remaining dust. Use Cyclo’s own quality-made Pad Covers to give your vehicle a beautiful shine without tedious hand-buffing. Save yourself time and effort with Cyclo!